Laylatul Qadr. 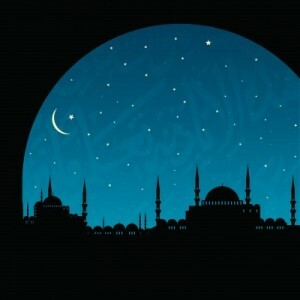 This night hidden in Ramadan, or in the last ten days of Ramadan is a night that tantalizes the heart of every Muslim. Its obscurity reminds us of the “hidden” hour of answered prayer on Friday and the hidden Great Name of Allah amongst His names. It is as though Allah wants us to put forth effort to seek out such special hours or times or Names by doing much, rather than just do good deeds on a pinpointed date. And its description as equaling a thousand nights or eighty three years makes it deserving of one’s full endeavor. We are told that, on this special night, angels crowd the sky so that there is no room for more. These angels come to greet the worshiping Muslims. Their very existence immerses the night in tranquility, safety and calm. “Peace”– words whose appeal is universal and everlasting — and hence my proposal to make this Ramadan one of peace throughout the whole month. Peace it is until the break of dawn. Salam, has many meanings: safety from harm and evil, peace, tranquility, greeting, calm. Peace is needed for an individual to be able to accomplish and give. Peace within oneself, peace in the family and peace in society. It is not a passive feeling that means lack of conflict or strife; rather it is dynamic state of being, driving one to accept with composure Allah’s qada’, driving one to tame their ego, anger and selfishness and finally allowing one to tune into the needs of others. The energy for all this coming from the closeness one desires and works toward with one’s Lord. Ramadan has long been recognized in part as being a month of training. We train ourselves to do more worship, to be more giving, to have more empathy and to spend more time on Quran. Let us as women add an important angle to Ramadan-training. No one has the power to change a humble dwelling into a joyful place of comfort like we can; and no one has the gift of making our family members feel special and worthy of all that is good like we do. Let us train ourselves to create an atmosphere of peace in our homes. Prophet Muhammad’s (pbuh) daily behavior and his normal interaction with his companions, strangers and family members was one built on respect, forgiveness and genuine care. So much of his advice has to do with how to treat one another with kindness. Specifically in Ramadan, we are told not to use bad words or to fight and to answer those who would provoke us into an argument with the response ‘I am fasting’. And yet as Muslims we fall sadly short of the model of our Messenger, peace be upon him. My theory is that we have not experienced enough such loving, forgiving and peaceful surroundings. If each woman did what was absolutely within her power and skill and changed her home into an abode of peace, giving it a ‘Night of Power’ atmosphere, think of the members coming out of such a home! Imagine a place where one felt safe of ridicule, sarcasm, fault-finding and name-calling. Imagine a place that looked neat, was clean and filled with the light of Quran. Imagine a place where smiles were the norm and slamming and shouting were rare. Only a woman could manage to design such an angel-friendly place, and only a woman connected to her Lord could do so with ease. May our Night of Power, Laylatul Qadr, be an extension of the peace we have initiated at the beginning of this month and a reward; and may the peace we instill in our families be one that they can recreate in their own future families. May this Ramadan be one of peace, a strong peace that starts from each individual woman’s heart, echoing into her home and spilling over into society…ameen. Ameen, ameen, ameen! May your words of peace bring peace to every home you have touched and every place you have walked, and every heart you have transformed. Upon you be peace dearest Khale. Our prayers are with you. A beautiful connection between Laylutul Qadr and peace. May we all taste of this peace this Ramadan so that we can carry it with us throughout the year. Thank you!